Stir with ice, strain into a cocktail coupe or champagne coupe glass with 4 oz brut Champagne (flute with 90+ Cellars Prosecco), and garnish with lemon oil (I included the twist instead of discarding it). 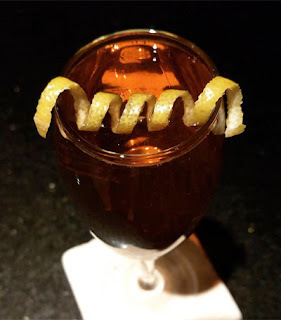 Two Fridays ago, I reached for Frank Caiafa's 2016 The Waldorf Astoria Bar Book and spotted the Cleopatra's Champagne Cocktail. The text attributed the recipe to the Waldorf Astoria Hotel but it never made it into the previous two books. Caiafa later explained in a personal communication that he had no clue about the drink's name with, "It was one of the few back stories that I had to leave open ended. The only assumption that I'm confident in making is that it originated from the current Hotel (not 5th Ave.)." Once prepared, my nose was greeted by lemon and apple aromas. Next, the sparkling wine notes were joined by more apple flavors, and the swallow began with a tart apple leading into a bitter herbal orange ending. Overall, I was impressed at how much the drink expressed a red apple flavor such that I searched a directory of heirloom apple varietals to discover that there is indeed a Cleopatra apple. When I mentioned this to Caiafa, he seemed pleased at the possibility that the name was linked to an old apple variety.